All our silver Claddagh Rings and gold Claddagh rings are hallmarked at the Irish Assay Office in Dublin Castle. This hallmark stamp guarantees that your Claddagh ring is an authentic Irish jewelry piece handmade in Ireland. 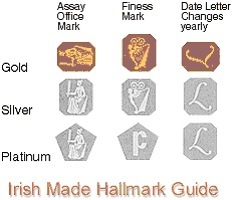 Under Irish law dating back to 1637, in the reign of Charles I, all jewelry of precious metals must be assayed and stamped with the official hallmark - the traditional letter symbol for the year it was crafted, a fineness mark guaranteeing the purity of the gold, and the official insignia of the Irish Assay Office in Dublin Castle. An assay is a test of the purity of an alloy. A tiny piece of metal is scraped from the piece and the percentage of gold, silver or platinum is determined. Official assay offices determine whether a piece qualifies for an appropriate hallmark. Gold jewelry is mixed with other metals and Karat (which means 1/24) denotes the purity of gold in the jewelry. 14k Gold is 14/24 gold mixed with 10/24 other metal. In 1204, King John sent a mandate to Meiler FitzHenry to build a castle in Dublin for the administration of justice and for defense. Records being scanty, it is not known how many years the construction took, however, in 1224 the following rooms were listed -"the chamber, the chamber beyond the Sheriff's chamber, the Alms Hall, the workshop, the pantry, the kitchen, the butlery." In the next year there is also mention of a chapel, or at least the fifty marks annual fee to be paid to William de Radeclive, cappelanus in capella nostra in castro nostro Dublinie (Chaplain in our chapel in our Castle of Dublin). From the thirteenth to the fifteenth centuries, castle officials went about the task of setting up the government and courts of law. Because all expenditure had to be sanctioned by London, developments were slow, also many of the men in petty offices seemed more interested in furthering their own gains than in attending to their duties. By the sixteenth century, things livened up with the siege laid by Thomas Fitzgerald (Silken Thomas, so named because of the embroidered gear of his horses) in 1534. Thomas, a grandson of the great Earl of Kildare, laid siege to the castle on its most vulnerable side. The castle defenders withstood the attack and Thomas directed his forces against the city. Thomas, however, tricked into believing the king's army had arrived, scattered his forces and narrowly escaped capture. Later, he was forced to surrender, and he and his five uncles were executed in London. In 1592 a remarkable escape occured when Red Hugh O'Donnell was imprisoned in the Castle to force his father into submission. He escaped, was recaptured, and escaped again into the Wicklow mountains with the brothers Henry and Art O'Neill. Because of the snowy, inclement conditions, Henry O'Neill was lost and Art died on the mountain. Red Hugh suffered from frostbite and eventually had both his big toes amputated. He regained strength finally and returned to Donegal, assuming the O'Donnell clan leadership. By the seventeenth century, the Castle buildings were used for meetings of Parliament and Courts of Law, as well as for the viceroy's residence. Many attempts were made to seize this vital center of administration, some haphazard, some carefully planned. All of them failed. In 1684, an event occured which brought a cessation to the Castle's role as medieval fortress. On 7 April a fire broke out in the viceregal quarters. To keep the fire from spreading to the Northeast tower where the gunpowder was stored and State Records were kept, acting Lord Deputy, the Earl of Arran, was forced to blow up some of the link buildings. Plans for new apartments were begun by the Surveyor-General Sir William Robinson. Working day and night, he completed them and the new construction was completed in October of 1688. The following March, James II came to occupy, arriving in far less splendor than his predecessor, the Lord Deputy. He left in haste, however, staying only one night after the defeat of his army at the battle of the Boyne (July 12, 1690). The eighteenth century was a period of comparative peace in Ireland. Craftsmen were given an opportunity to practice their skills, the results of which can be seen in what is collectively termed Georgian Architecture. Dublin Castle shared in this activity; it is from this period that most of the existing Upper Yard buildings date. The Genealogical Office was completed in mid century, and the State Apartments were reconstructed in the form in which they appear today. By 1780, it was claimed the Castle and State Apartments were superior in construction and appointments to the palace of St. James. The Castle lost some of its lustre in the Rising of 1798 when mutilated bodies were hauled into the Castle-yard and stretched out in the sun in full view of the Secretary's windows. Here they lay as trophies of the first skirmish. The 1803 Rising saw another abortive attempt to seize the Castle. But Robert Emmet's plan went awry, and he himself was captured and executed. Most of the time during the nineteenth and early twentieth centuries, the Castle was at variance with and insulated from the happenings throughout Ireland. Astonishingly, when the Famine was at its height, and more than a million were dying, the Castle continued its uninterrupted rounds of balls, levees, and opulent living as if nothing around the country was of any consequence. later in the century, a few British statesmen raised words of warning, however, they went largely unheeded. Tension climaxed in the Easter Rising of 1916. The rebels entered the precincts of the Castle, while others scaled the gates. They also took possession of the Dublin Daily Express, where from the rooftop they guarded the approaches of Dame Street, Castle Street, and Cork Hill--to the Upper Castle Yard. The regular troops regained possession of it in the afternoon. This proved to be the last attack on the Castle. Six years later, on 16 January 1922, it was handed over to Michael Collins and the Irish Free State. Thus 700 years of English rule had come to an end. A tour of Dublin Castle is a must for anyone interested in Irish history. The State Apartments stretch along the entire south side of the yard at first floor level. Portions of this section have been rebuilt numerous times. Though originally built to provide accommodation for the Lord Lieutenants (the viceregal representative in Ireland), they generally avoided living here from the late 18th century, choosing instead to reside in the Viceregal Lodge in Phoenix Park. They did, however, stay in the Apartments during "Castle Season", the period of official entertaining that started the first week of February and ended with a great ball on St. Patrick's night. Today the Apartments are used for the most important State receptions, also for the inauguration of the Presidents of Ireland. Thank you for visiting our site. Please take some time to enjoy our collection of Irish Jewelry.